Habitat : Widely cultivated in india. Uses : It is the source of flour for the world's bread making. Main use is for flour and breadstuffs known by various names throughout the world. Grain also is the source of alcoholic beverages, beer, industrial alcohol made into synthetic rubber and explosives. Bran from flour milling also an important livestock feed. Germ is valuable addition to feed concentrate. Grain fed to livestock whole or coarsely ground. Starch is used for pastes and sizing textiles. 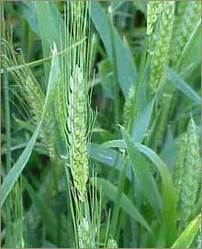 The seeds are used in folk remedies for cancers, corns, tumors, warts and whitlow It is used as a shampoo and vulnerary, common wheat is a folk remedy for burns, warts, whitlow, diarrhea, dysentery, ecchymosis, epistaxis, fertility, fever, flux, gravel, hematuria, hemoptysis, cancer, hemorrhage, incontinence, leprosy, menorrhagia, neurasthenia, night sweat, perspiration, scald, tumor and wounds. The young stems are used in the treatment of biliousness and intoxication. It is also used in the treatment of night sweats and spontaneous sweating.